To put it into a sentence, we train and work with farmers in Ethiopia to make family-owned, easily-maintainable household water wells by hand with simple appropriate technology, using only locally available and affordable materials. 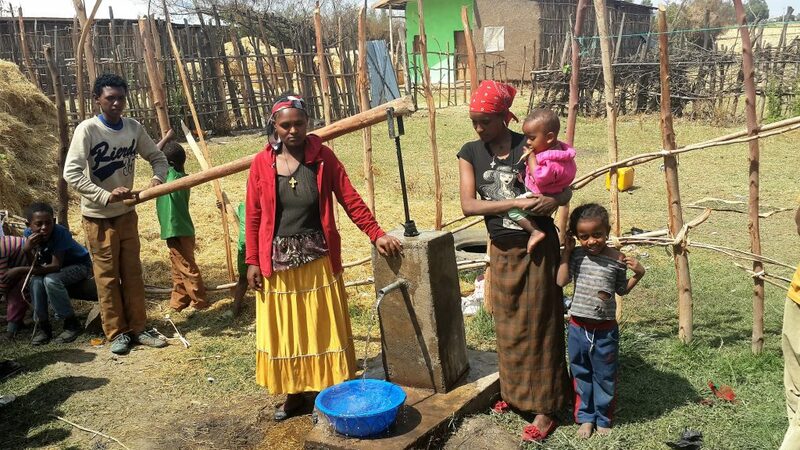 In Ethiopia, our WFA work is carried out under the umbrella of a local partner non-profit organization called Ethiopia Addis Kidan Baptist Church Welfare and Development Association (Addis Kidan for short). Addis Kidan legally registers the project and handles the bureaucratic load. They are an invaluable part of our mission. Water for All funds the project and I— a Water for All International missionary—design and drive it. 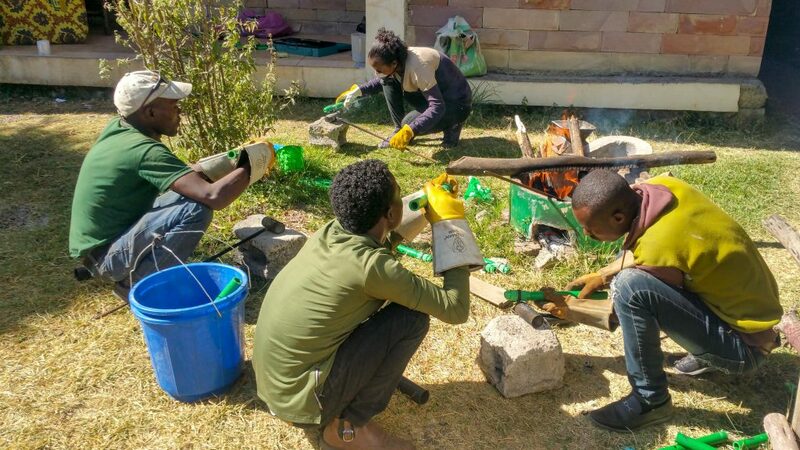 We started with a one-year pilot project: an intensive practical training program for nine Ethiopians in doing metal work, making drilling tools, drilling boreholes, making pumps, installing pumps, and maintaining pumps. During the training we made 27 wells in a nearby community. Our wish was to empower Ethiopian men to do the field work and increase their responsibilities over time. We were then licensed a three-year extension project for employing our trained men to lead well clubs and make wells under my leadership (for an explanation of well clubs please visit our method page). We recently completed this project with a total of 189 new wells. To ensure sustainability, our field workers visited the homes of each well owner and gave them one-one-one training in the maintenance of their own water wells, using each owner’s personal well for demonstration and practice. During this training, our field workers showed the well owners how to pull out the pump to see if anything needs replacing, and trained them how to replace those parts. The design of the pump is such that everyone learns easily. The field workers guided the well owners in the making of three replacement piston seals for them to keep for their own pump—enough for many years. In addition, each well club was given a “pump maintenance kit”: a set of materials—all attached together by a rope so that they will not be lost—which is given to a leader of each well club for the benefit of any member of that well club. The kit includes sample piston replacement materials and simple hand tools which can be used by any member of the club to make replacement piston seals. The kit also includes laminated written instructions in both the Amharic and Oromo languages. Since this kit has been provided to every well club of the project, every well-owning family will have easy access to the information and tools necessary to keep their well flowing for generations, even if the trained person forgets or passes away. This puts some much-needed independence and water security into the hands of individual families, we are glad to report. We are now undergoing the standard end-of-project government evaluation, as well as the planning stage for the future. For the next project, we intend to—in addition to helping rural families make their own water wells—add a new initiative to the project: helping people more easily water gardens during the dry season with their own wells. This is a great need for improving income security. We have been designing and testing attachments to our wells that can enable owners to more easily pump sufficient water for a garden without becoming overtired. We are also testing the making of wider diameter boreholes and pumps. 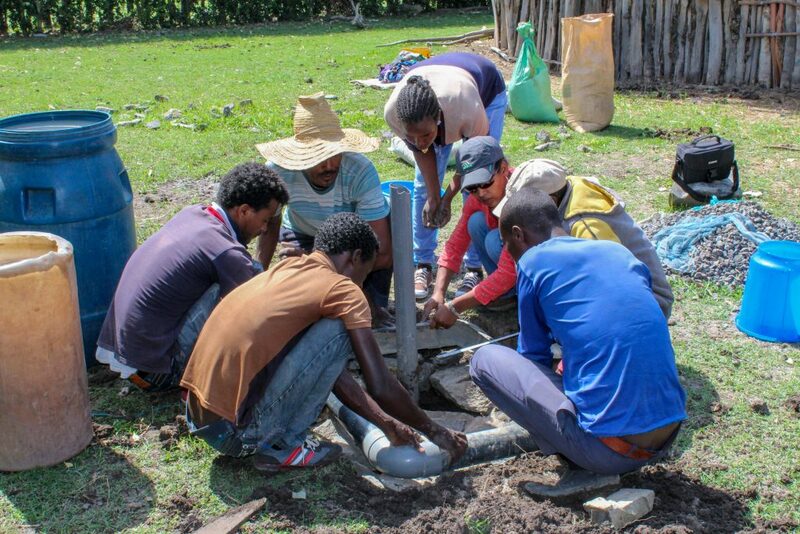 Here, Almaz (in the blue cap) and I train the workers to make the concrete pad and column for the well. Our project is located in Becho Woreda and Dawo Woreda, which are two large, adjacent rural counties in the South West Showa zone of the Oromia region in Ethiopia. It is a relatively flat, purely agricultural region. For detailed updates on our work, please contact me through the contact page of this site to request being added to our prayer letter email list.